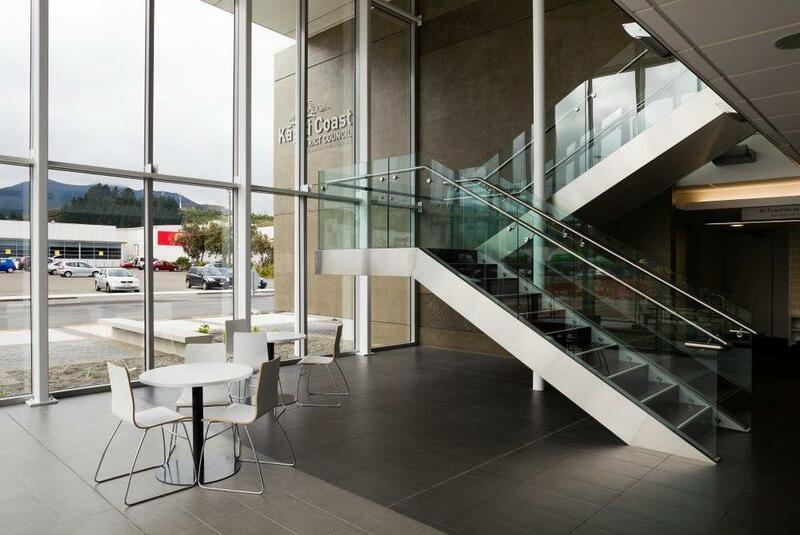 Kapiti Coast District Council appointed DGSE as their Architect following an invitation to provide a Concept Design proposal for this project. Upon appointment, the initial project brief was jointly reviewed to ensure the cost of the completed development could be contained within approved project budgets. KCDC had operated from somewhat tired and cramped conditions that were not publicly accessible. The project afforded opportunity to address significant operational deficiencies and in a location that would become the gateway to the future Civic heart on the Kapiti Coast. The approved Project Brief included requirements for substantial refurbishment to accommodate some 150 staff; capacity for future expansion; provision of a building with an appropriate civic presence; functional, adaptable, efficient and cost effective working environments; adoption of environmentally sustainable initiatives; a future-proofed building to cater for technology advancements, and most importantly a civic building that would be completely accessible. The project vision was “to create a place where democracy is delivered, and seen to be delivered”. DGSE offered substantial experience through the successful completion of a number of similar projects for other Local Authorities. The design response embodied partial demolition of the existing building, construction of a new two storey extension, extensive seismic upgrades, a new public entry, new Council and Mayoral chambers, provision of open plan offices within a public friendly environment for local residents and visitors. Considered attention was placed on spatial planning to ensure appropriate integration of governance and management functions, and public spaces. In particular, the heart of governance on the Kapiti Coast is now a warm and welcoming destination, and the new heart of democracy. A new modular furniture solution was developed to provide optimum and cost effective flexibility for many years ahead. The completed building creates a civic gateway respectful of the form and scale of the adjoining public buildings and local Iwi. Significant attention has been given to embodiment of sustainable design features including optimization of glazing and shading, responsive heating, cooling and lighting systems, passive thermal design initiatives with respect to the building envelope and structure, waste management systems, considered selection of local and sustainable materials and engagement of local suppliers and contractors. DGSE are extremely proud to have part of this successful project.